This component retrieves data on a Cassandra server and loads it into a table. This stages the data, so the table is reloaded each time. You may then use transformations to enrich and manage the data in permanent tables. Note: Cassandra Query defaults all object names to lowercase and thus lacks any case sensitivity in this respect. This can mean that, when looking for upper or mixed-case objects, the component will fail when it apparently should have succeeded (sometimes failing even when the component successfully validates). To enable case sensitivity, use the 'CaseSensitivity' option in the Connection Options property and set it to 'true'. Advanced - This mode will require you to write an SQL-like query to call data from Cassandra. The available fields and their descriptions are documented in the data model. Server Choice Address of the Cassandra server from which data is to be sourced. User Text Login name for the Cassandra server. Password Text Login password for the Cassandra server. Users have the option to store their password inside the component but we highly recommend using the Password Manager option. This example will take data from a Cassandra database and load it into a table. The job begins by creating a table on the database, then the Cassandra Query Component is used to take data from Cassandra, copy it to an S3 bucket and then finally load it into the table. Create/Replace Table Component is used to make the table 'Example_Cassandra', which is then entered into the Cassandra Query Component's Target Table field. Details regarding the Cassandra server and login credentials are added and a data source is chosen. Since we want all of the data, there is no need to add to the 'Data Source Filter' or 'Limit' properties. Similarly, a Sort Key is not required but is recommended for large tables. Note that the table must exist before Cassandra Query is run. 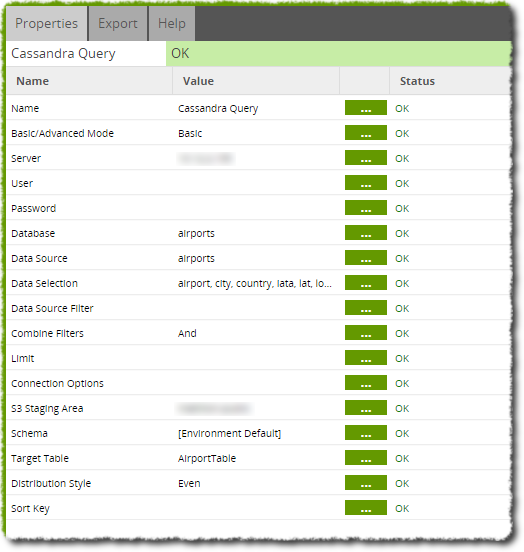 Running the Create/Replace component table first will create the table, then the Cassandra Query or the entire job can be run to load data from Cassandra into the table.